Philippe Alexandre CHEVALLIER, born in 1961 in Paris. Advertising photographer specialized in still life and mainly food photography since 1992. After a film-making training he then gravitates towards photo reports from 1985 to 1992, creation date of his shooting studio in Paris. He collaborates with the Leo Burnett, Publicis, and Mac Cann agencies, and with Biosphoto agency for fieldwork. 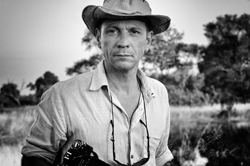 Passionate about travelling, he discovers Africa in 1998 – mainly Southern Africa (Botswana, Namibia), chosen land where he continues his work on fauna and peoples. The low human population density of this land still guarantees the preservation of wild areas. His work is evidence of the fragility of a world living on borrowed time. “My Work is a tribute and a testimony to this fauna facing a precarious future. As I refuse to use a telephoto lens, wildlife photographers’ preferred equipment, I am able to be closer to the animals; centering them in their environment enables me to capture the animal’s energy and unveil their individuality”.